I’ve got to admit, despite owning a launch day Nintendo Switch and more games for it than I’ve had time to beat, when the first two Labo kits came out earlier this year in May, I skipped over them like a hot turd on a steamy sidewalk. It’s not because Labo is bad, it just didn’t seem like my kind of thing, and I was totally OK with that. I don’t have kids to build the kits with, the cardboard looked finicky, and the whole thing seemed more like an educational tool masquerading as a conventional but not entirely fleshed-out game. 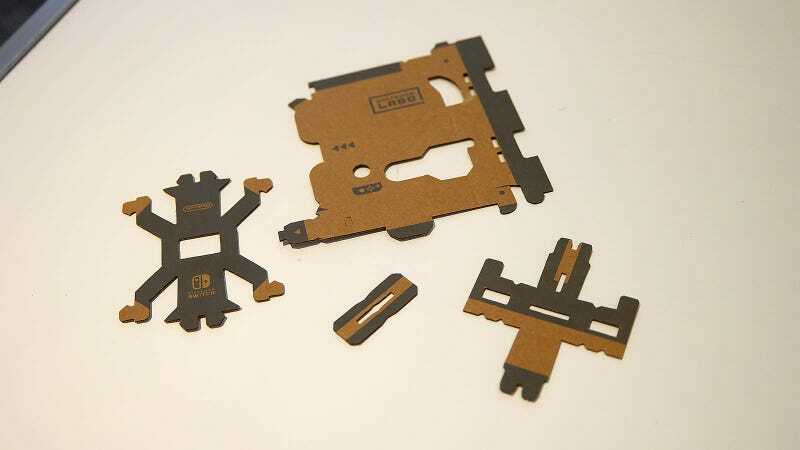 Besides, cardboard is the material actual products come inside of — not the main attraction of a £70 package. Once you’re done building it, the right Joy-Con slips right inside the card board key. The left Joy-Con goes inside the pedal kit. 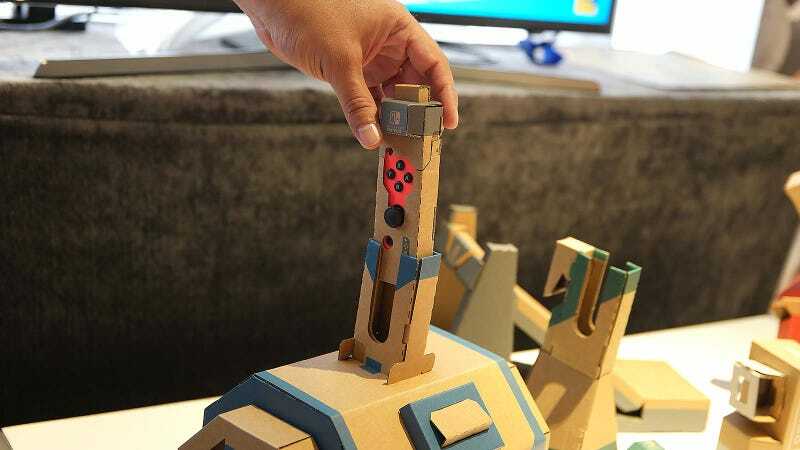 And so it was with this mindset I went to check out Nintendo’s third playset for Labo which features an all new standalone game and a new vehicle kit that lets you build three different Toy-Cons — Nintendo’s word for each little cardboard construction. While each Toy-Con is named after the thing its meant to control (car, plane, and submarine), the things that you actually build are the controls used to manoeuvre each vehicle (steering wheel, flight stick, weird twisty barrel thing, and a handy foot pedal that works with all the other Toy-Cons), along with a little cardboard sleeve that turns a Switch’s right Joy-Con into a key of sorts. 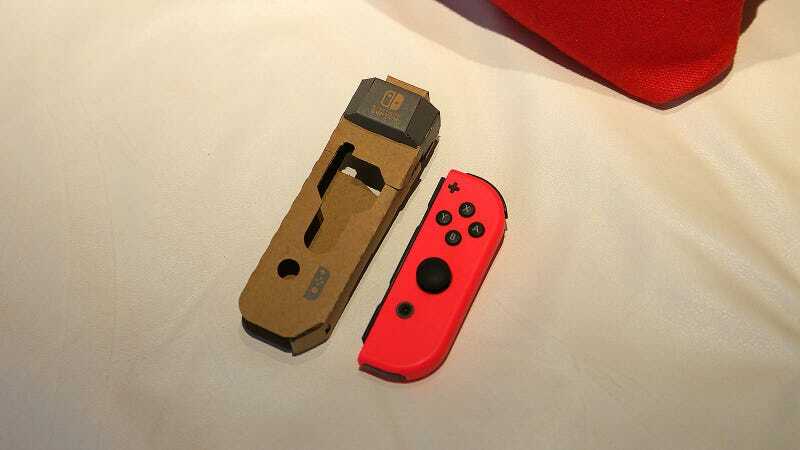 So after building my very own Toy-Con key in in about five minutes, I got the chance to sample some of the gameplay that was powering all the Switch’s new cardboard-enhanced action. The big change compared to the original sets is that instead of each Toy-Con model being siloed into its own little mini game, the Vehicle Kit ties everything together by way of the new Adventure Mode, which is the main avenue for using your newly created cardboard controls. In it, you can roam the open country, completing quests like helping brightly coloured cows find their way back to their corral, or reuniting a lost baby Loch Ness monster with its mother. And when the mood strikes, or a specific quest requires it, you can switch from one vehicle to another simply by grabbing the Toy-Con Key and dropping it into one of the other kits. This sort of continuous, sprawling game world has a big effect, because almost immediately I was getting flashes of the SNES classic Pilotwings. It gives Adventure Mode a much greater sense of freedom along with a more traditional game structure, all while Labo’s cardboard models made everything a bit more immersive as they served as fun little controllers that if they were made out of plastic, might have otherwise cost £40 to £50 a pop. And in game, each vehicle has its own unique set of tools like the car’s dual buzzsaws, the plane’s missile launcher, or the submarine’s underwater grappling hook. Here’s a better look at the pedal kit and the slot-car racing game. And while I only had time to explore just a few sections of the map, with what looks like another 15 to 20 areas still undiscovered, some of my fears about the game being light on content and more focused on building were relieved. But of course, there’s more to the Vehicle Kit than just Adventure Mode. Battle Mode lets you brawl for vehicular supremacy in a very Mario Kart-like way, while the Slot-car Racing Mode evokes the simple joy of old school car and track actions. The spraypaint kit even has little boxes inside that mimic the shaker balls found in a real paint can. There’s also a paint shop and an included spray can cardboard model, so you can customise and tweak each vehicle’s settings to your liking. 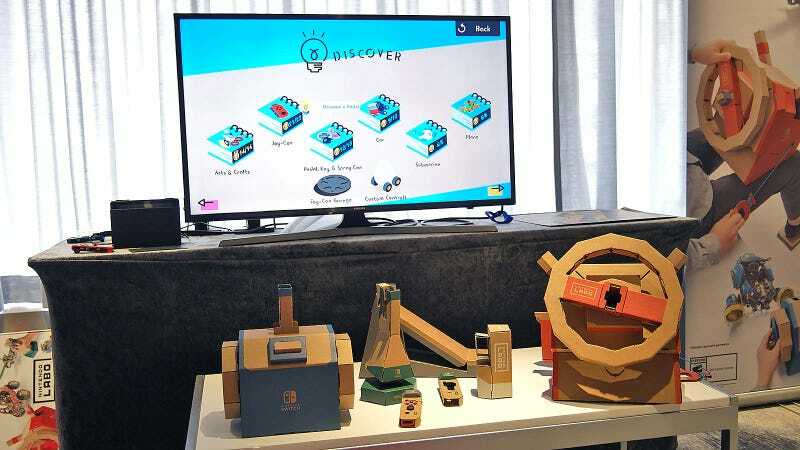 And as with previous Labo kits, for the passionate DIYer at heart, you can also create and program your own Labo models from whatever you have lying around the house. 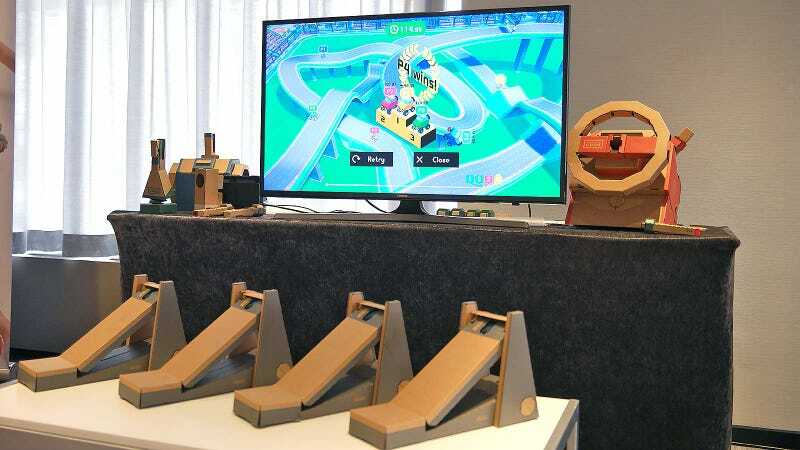 In a lot of ways, I’m actually kind of glad that this was my first in-person experience with Labo because it left me thinking about all the fun racing games I played as kid, and how they could have been better. The Vehicle Kit would have have been a great addition. As for the older Labo Kits, I can already play piano (kinda), and I can go fishing just as easily in Zelda: BotW, but the combination of a bigger world and neat, bespoke controllers seems more like the platform I hoped Labo would be. 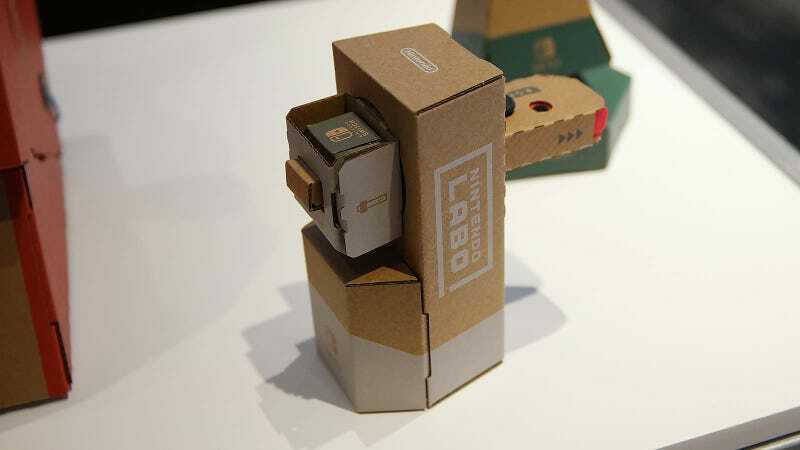 That said, I’m still not 100 per cent on board with Labo because all those cardboard models already left me worrying about finding room for them in my cramped apartment, and at the demo, some of the models’ cardboard flaps came undone in my hands. But then I remember again, Labo wasn’t really made for me, it’s for the kid I was 20 years ago who probably would have been ecstatic to have a driving/flying/piloting game as unique as this. Just so long as I had someone else to help me put the cardboard together.